At Camden Lock there’s a new ice cream parlour: Chin Chin Labs. 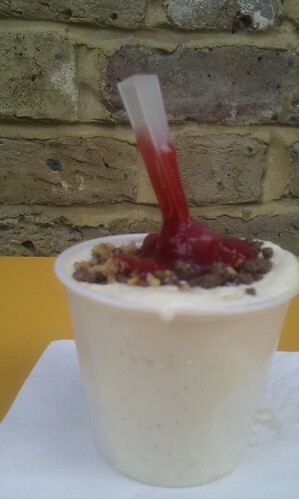 It bills itself as London’s first nitro ice cream parlour. The staff use nitrogen to snap freeze liquid base that becomes the ice cream. You can get vanilla, lemon or chocolate with a variety of toppings. During the snap freeze process the gas creates a cooling and atmospheric mist that rolls off the mixing bowl and during summer is a wonderful relief. I selected a Madagascar vanilla bean base with chocolate, hazelnut and rasberry toppings. At first glance I thought the quantity for £3.5o was a little small but it’s surpisingly dense and filling. Now the flavour. It was remarkably smooth and tasty, with no threat of an ice cream headache. The combination of toppings also worked quite well. One of the owners who served me advised that in winter they’ll be doing warm options too. Might come back for that as well. It’s certainly a novel creation method and tastes great but I wouldn’t recommend it as a special trip but if you’re in the area definitely check it out. The ‘lab’ is located at 49-50 Camden Lock Place (look out for the shop with the swing chairs). Unfortunately their website doesn’t yet specify the opening times. Also the FT article was particularly useful in inspiring me to visit.